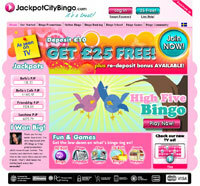 Jackpot City Bingo claims that their online facilities are a treat to behold. It remains to be seen over the course of this review if that is indeed the case. The software package that is used by Jackpot City Bingo is a software package that was first created by the Microgaming Corporation. Microgaming is known more for their online casino and poker software than they are in the case of online bingo, but this has not stopped them from creating a world class software package that you can easily ride to victory. With crisp graphical lines, decent functionality and excellent resource efficiency, you can certainly run Jackpot City Bingo at the same time as other software programs and still get the maximum enjoyment from the experience. Jackpot City Bingo, probably more so than many of the other online bingo sites out there, has gone that extra mile in order to emulate the excellent atmosphere of the bingo hall in its online bingo game. This means that you can use Jackpot City Bingo as a way to catch up with old friends while maybe winning some money at the exact same time. Jackpot City Bingo has 90-ball bingo just waiting for you to get started and it has many complementary bingo games as well that can be played when you need a break from the grind of the 90-ball bingo hall tables. Jackpot City Bingo does not really have a percentage and maximum format for their signup bonus. Instead, they have a welcome bonus that is worth GBP 25.00 as long as you deposit GBP 10.00 or its equivalent in another currency. You can deposit more if you want, but the GBP 25.00 is the standard amount of the first bonus as long as you meet that minimum. Once you’ve started playing online bingo however, you can get redeposit and even daily bonuses that will allow you to keep the flow of promotional money going. Players from the United States cannot play online bingo at Jackpot City Bingo. The Bingo FAQ available on the website should definitely be your first line of support for any problems that you might have. In the event that the FAQ does not help you out that much, the next step to take is to contact support@jackpotcitybingo.com for e-mail support or to click on the help link on the website in order to access live chat support. Both of these methods will get you high quality support with a level of accuracy that is hard to beat. Jackpot City has always been a great Microgaming mainstay and it appears that their move into the world of online bingo has also been along those lines. They claim to be a treat and all indications are that they are able to make good on this claim.